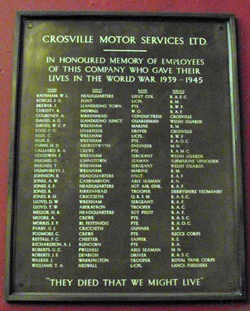 The memorial commemorates those employees of Crosville Motor Services Limited who died during the Second World War. It is today located at the Grosvenor Museum, Chester. The company was formed as Crosville Motor Company Limited in 1906 in Chester, by George Crosland Taylor and his French business associate Georges de Ville, with the intention of building motor cars. The company name was an amalgam of 'Crosland' and 'de Ville'. By 1909 Crosville had commenced its first bus service, between Chester and Ellesmere Port, and went on to become the largest bus operator in north and mid Wales, as well as parts of Cheshire and Shropshire, in England. In 1968 Crosville, along with most other large bus operators, became part of the state-owned National Bus Company. Following the "deregulation" of bus services in the 1980s, the Crosville brand was gradually phased out and today most of the former Crosville services are operated by Arriva. Workshop Coy., Indian Engineers 8 Jun 1943 44 Chester Headquarters. Son of Capt H Baynham, OBE, RN, and of Mary Baynham (nee Janisch); husband of Mignon V R D Baynham (nee Forster), of Cheltenham, Gloucestershire, England. Rangoon Memorial, Burma. (11th Bn.) 14 Sep 1942 Flint Depot. Son of Ernest Charles & Lily Bowles; husband of Edith Bowles, of Shotton. Plymouth Naval Memorial, Devon, England. (12th Bn.) 12 Apr 1941 27 Llandudno Town Depot. Son of Sylvanus & Margaret Brewer; husband of Winifred Brewer, of Llandudno. Great Orme's Head Cemetery, Llandudno. (49 Sqdn.) 24 May 1943 Heswall Depot. Reichswald Forest War Cemetery, Nordrhein-Westfalen, Germany. COURTNEY Civilian Conductress at Birkenhead Depot. 2737191 Welsh Guards (1st Bn.) 11 Aug 1944 22 Llandudno Junction Depot. Son of Robert & Catherine Davies, of Llandudno Junction. Bayeux War Cemetery, Calvados, France. (HMS Kite) 21 Aug 1944 29 Wrexham Depot. Son of Thomas and Beatrice Davies, of Llay, Wrexham. Plymouth Naval Memorial, Devon, England. EGGS Civilian 17 Sep 1940 29 Driver at Liverpool Depot. Husband of Eileen Clara Eggs, of 12 Rathbone Road, Wavertree, Liverpool, England. Died at Stevenson Street Shelter. ELLIS Royal Welsh Fusiliers Wrexham Depot. (48 Field Regt.) 12 Sep 1944 30 Wrexham Depot. Son of Thomas Ellis, & of Elizabeth Ellis, of Rhosllannerchrugog. Singapore Memorial, Singapore. (SS Justitia) 22 Nov 1940 Aberystwyth Depot. Son of Dudley & Mary Evans, of Llandeilo, Carmarthenshire. Sunk in the Atlantic by U-100. Tower Hill Memorial, London, England. 7359944 Royal Army Medical Corps 22 Jan 1944 25 Crewe Depot. Son of Arthur & Maude Galliard, of Leeds, Yorkshire, England. Thanbyuzayat War Cemetery, Burma. (3rd Bn.) 28 May 1944 35 Wrexham Depot. Son of John & Mary Goodwin; husband of Marie Elizabeth Goodwin, of Cefn Mawr. Cassino War Cemetery, Italy. (HM Sub Upholder) 19 Apr 1942 26 Johnstown Depot. Son of Samuel & Sarah Ann Hughes, of Wrexham. Sunk off Italy. Chatham Naval Memorial, Kent, England. HUGHES Welsh Guards Wrexham Depot. (HMS Exeter) 28 Apr 1945 Wrexham Depot. Ambon War Cemetery, Indonesia. JOHNSON Royal Air Force Chester Headquarters. JONES Royal Navy Caernarfon Depot. S/103299 Royal Army Service Corps 11 Jul 1943 29 Criccieth Depot. Son of Owen & Martha Jones; husband of Margaret Ruby Jones, of Porthmadog, Caernarfonshire. Brookwood Memorial, Surrey, England. LLOYD Royal Air Force Wrexham Depot. 14497632 Royal Armoured Corps 25 Jan 1944 18 Aberaeron Depot. Son of John & Ann Lloyd, of Aberaeron, Cardiganshire. St. David's Churchyard, Henfynyw, Cardiganshire. (10 Sqdn.) 16 Jul 1943 21 Chester Headquarters. Son of Harry Briggs & Mary Mellor. Recey-sur-Ource Communal Cemetery, Cote-d'Or, France. T/286098 Royal Army Service Corps 1 May 1943 41 Crewe Depot. Son of Charles & Rebecca Moore; husband of Doris Moore, of Crewe, Cheshire, England. Stellawood Cemetery, Durban, Kwazuku Natal, South Africa. (51st Div. Ordnance Field Park) 16 Dec 1944 22 Blaenau Ffestiniog Depot. Son of Ellis Price & Kate Morris, of Blaenau Ffestiniog, Merionethshire. Scoonselhof Cemetery, Antwerp, Belgium. (199 Bty. 81 L.A.A. Regt.) 2 Mar 1944 Criccieth Depot. Son of Mr & Mrs James Parry, of Criccieth, Caernarfonshire. Criccieth Burial Ground, Criccieth, Caernarfonshire. (56th Regt.) 14 Jan 1943 28 Crewe Depot. Son of George & Harriet Ann Podmore, of Crewe, Cheshire, England; husband of Hilda May Podmore, of Crewe, Cheshire, England. Medjez-el-Bab War Cemetery, Tunisia. 1913102 Royal Engineers 17 Jun 1940 20 Chester Depot. Son of Walter John & Violet Hutchinson Rastall, of Great Saughall. Dunkirk Memorial, Nord, France. RICHARDSON Royal Artillery Runcorn Depot. ROBERTS Merchant Navy Pwllheli Depot. (550 Gen. Transport Coy.) 8 Apr 1942 36 Denbigh Depot. Son of Robert John & Ellen Roberts, of Denbigh; husband of Ethel Roberts, of Denbigh. Halfaya Sollum War Cemetery, Egypt. WALKER Royal Tank Corps Warrington Depot. WILLIAMS Lancashire Fusiliers Heswall Depot.